TAG International’s professional roster comprises of the most prolific assembly of international coaches to be found anywhere in Singapore. With decades of instructional and professional competitive experience worldwide, our coaches are equipped with an unmatched wealth of experience and expertise. At TAG International, we firmly believe there is no substitute to being taught by the best tennis coach. Immerse in the TAG International experience now. At TAG International, Where Champions Learn to Play. Senior Coach at E-SPORTS Aviation Club, Bur Dubai, U.A.E. Junior Coach at Practennis School of Tennis, Andheri West, Mumbai. The requirement to be a tennis coach of the TAG International Tennis Academy coaching roster includes the following minimum requirements. Accordingly you can be assured that your TAG International Tennis Academy tennis coach will not only be (a) highly certified, but also (b) be able to strike the ball at a very high level, and (c) be able to play matches at a very high level. 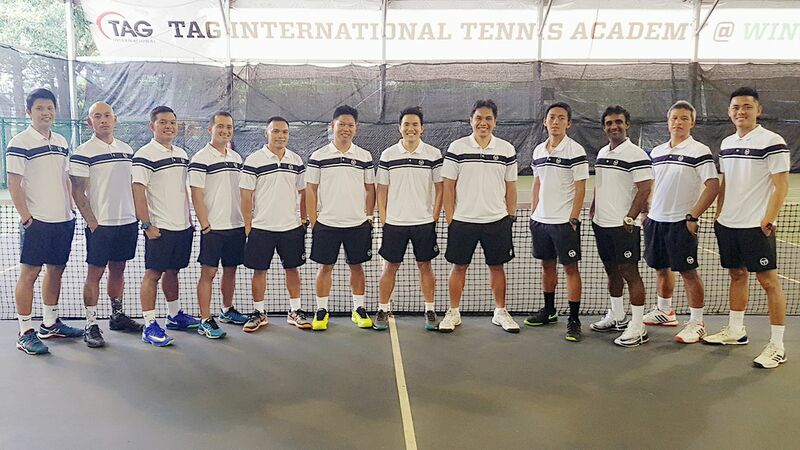 In fact many of TAG International Tennis Academy’s Tennis Coach es compete in the Singapore tournaments when they first join our team and win the singles and/or doubles titles in the Singapore Open or the Singapore Tennis Association Inter-Club A Division Championships. Dedicated attitude towards trainee’s improvement. Immerse in the TAG International Experience Now. Contact us at contactus@tagtennis.sg or at +6598395232 for more information or to arrange your tennis lessons. Or send us a message here.